In Jane Wong’s Ted Talk on her poetics of haunting, she says haunting is not “a matter of the past coming back, repressed…but is a productive and intentional act to go toward the ghost and rewrite forgotten history.” There are two premises in this poetic statement necessary to the poems in Overpour: first, in Wong’s poetics, the ghosts are real and have a physical location that can be moved toward; second, the ghosts, and through them haunting, is something that one seeks rather than avoids. This posits an interesting, and in this collection fruitful, relationship between the past, present, and future, not only because of the implied porousness of the boundaries between the past and present, but also because allowing oneself to be haunted—to seek it—takes what is typically thought of as evil (“haunting” “demonic possession” “pallid like a ghost”) and uses it for its experiential power. Here, Wong is in charge of the potatoes. She’s unsure if she let them boil over, and because of (despite?) her inattention, the potatoes’ entire life span passes by: they go from spore (alive/edible) to spoiled (inedible/dead). This transformation turns the potatoes into a textual ghost in the course of four words. Also, significantly, the potatoes’ transformation occurs inside boiling water, and the water has escaped the pot, the corpus meant to contain it. Like a ghost-medium, the boiling water escapes into the air to cause new transformations, to drag out new ghosts for new hauntings that then drag the haunted, the subjects of the poems and the readers themselves, across time and space. In the eighteen poems that make up this book, the page itself plays the role of the conductive water that hosts the myriad ghosts that Wong haunts us with in the text: her thoughts, family members (especially her mother, whom Wong writes as in a sequence of numbered poems titled to indicate her mother’s age at the time of utterance), immigrants (related and not), villagers (related and not), animals, the food she cooks, the sun, and even some historical figures—collapsing the nouns to make up an overpoured present. Wong typically introduces new subjects one by one as the sole subject in an individual unit of meaning—the body of the sentence, an enjambed line, a single phrase, or a broken-up stanza sitting alone on the page. Wong’s line breaks, felt or dictated, act as the threshold that allows the subjects to pour into each other and inhabit new meanings across a poem. Each image, each question, each declaration, is transformed as much by what comes before it as the text to come. In this way, Wong takes the ideas, narratives, and people of histories—personal, social, intuitive—and communes with them (or literally through them as the reader reads down the page). All of Linnaeus’s pupils died on their journeys. under a pile of sweaters. To begin, Linnaeus’s pupils perish in the scientific “process of discovery.” Lines later, and three hundred years, we’re haunted by the fate of Linnaeus’s pupils as the subject shifts to Wong’s mother. The idea of immigration is haunted by the idea of science; thus immigration becomes, like science, a journey of “discovery and documentation.” As an immigrant, however, Wong’s mother is susceptible to danger, like the pupils who died for discovery, needing paper evidence of her place in the US. So, she keeps her documents, which might be necessary for her safety, in an interestingly informal-yet-personal spot, “under a pile of sweaters.” In this poem, as in many of the poems in the book, the caesura is the liminal space, the space between the cracked lid and the pot, in which each idea enters into the other and is transformed. Tell me what kind of habits should I adopt? What makes Wong’s approach to “rewrit[ing] a forgotten history” so captivating is the breadth of what haunts the page. In “Twenty-Four,” one of my favorite poems in the collection, Wong speaks through her mother at twenty-four to consider her mother’s life choices: “Cloud and / cough, I couldn’t even see / my hands in the morning.” A few lines later, “Overpour / of regret, there is too / much blood in a cow to comprehend. At twenty I halved caution/ and called it Jane.” And then, a few lines later, “A continent away, // hay pours into a field. / Each time my father waves // across the shore, I dissolve / one part more.” The leap between subjects from line to line accentuates Wong’s sharp images. By the speed of their movement, the ghosts in the previous line pushes the reader to keep up, to be willing to go toward the ghosts of multiple nationalities, of multiple species, and of human choices—ghosts gazing and being gazed at across continents. 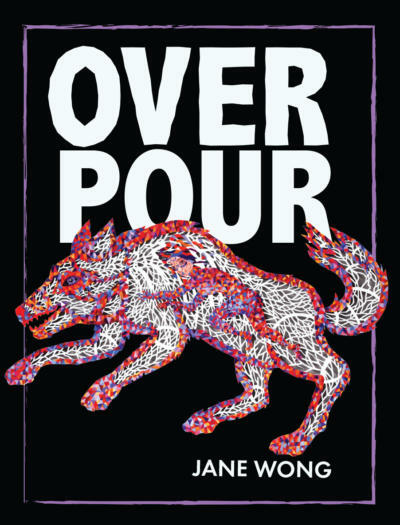 Throughout Overpour, Wong, time and time again, calls readers to participate in piecing the pieces together with her. She asks readers to be attentive to the feelings, events, and histories that she writes about—from her own life and the lives of others. She gives us the ghosts. She gives us the space to haunt ourselves.